There are two major elements of safety when it comes to using a crane on a job site. The first is quality equipment and the second is properly trained operators. Of the two of these, the most important is well-trained operators. This is because it takes knowledgeable individuals to keep your equipment maintained and to recognize when repairs are necessary. In addition, no matter how good your equipment is, if your operators aren't using it properly, you are at a tremendous risk. Most accidents occur due to operator error. We can provide the training at your site, or at a location convenient to your operators. 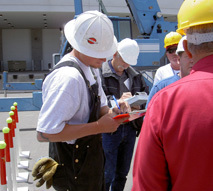 Contact us today to learn about Isom Crane's training programs. Certified Prepatory training instructor for the National Crane Operator Certification program.